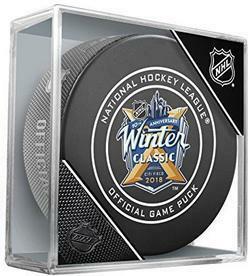 The 2018 NHL Winter Classic was an outdoor regular season National Hockey League game, part of the Winter Classic series, played on January 1, 2018. The game featured the Buffalo Sabres matched up against the New York Rangers at Citi Field in the New York City borough of Queens. It was the Rangers' fourth outdoor game, J. T. Miller of the Rangers scored on a rebound in overtime to give the Rangers a 3–2 win over the Sabres. Prices shown are for quantities of less than 12 total pucks. Made by In Glas Co. Discounts are: 12-49 pucks @ $8.00 ea. / 50-99 pucks @ $7.75 ea. / 100+ pucks @ $7.50 ea.